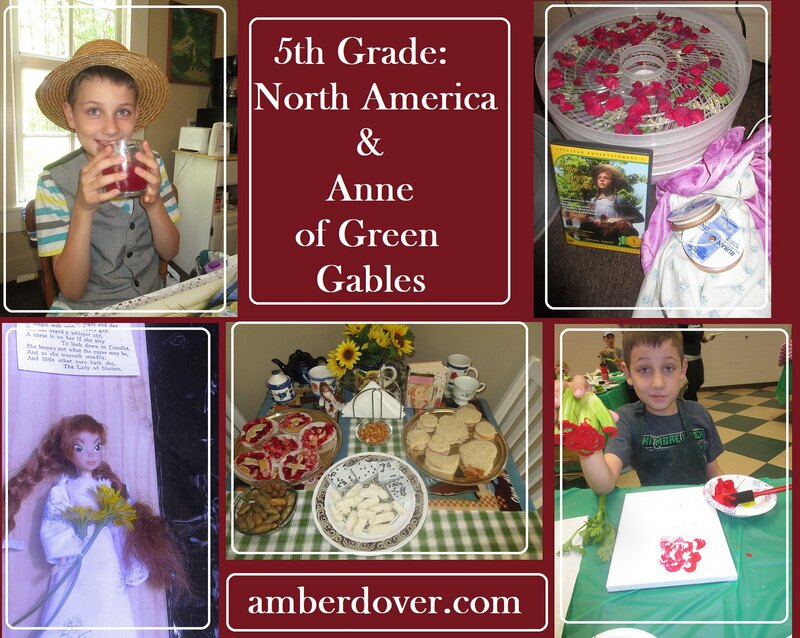 In this post: North America Study and an Anne of Green Gables tea party! Join us for food, fun, and crafts! Hello, Dear Ones! This is my 9th post for our 5th-grade studies from a couple of years ago. In geography, we learned about North America with a focus on Canada and the United States. In science, we learned about steam engines. We read Anne of Green Gables for Language Arts and had a lovely tea party with fun crafts. We also learned how to paint spring flowers with celery at our homeschool group. In art, we learned about pointillism. We did these studies in the spring of 2016. Here’s how we learned! Pointillism Train in the style of Seurat- We combined art and our science lesson about steam engines. Also, Anne (from the book we studied) traveled by train in Canada. As you can see, Pointillism is an art method where you use tiny dots to make a picture. A Canada project board with all the things we learned about– Anne of Green Gables, basketball, a Canadian moose, Mounties, and Niagra Falls. Also, we included a postcard from our best friends the Chambers that they got in Canada. Anne’s Trip to the Park- We had so much fun with Anne of Green Gables and it went great with our study of Canada. We found the perfect red-headed doll at Goodwill. Then we took her on a trip to the park so she could reenact a scene from the movie, Anne of Green Gables. The Lady of Shalott…by Alfred Tennyson and played by Anne. I’ve included a clip for your entertainment. I LOVE this movie! No worries…we didn’t let our doll drift far. I got to say though…it was a bit creepy. A tree fell not far from us after we read the poem. We left in a hurry. Anne of Green Gables Movie Party & Proper Tea- We went to Nana’s for tea and sweets and watched the movie. Pot Pourri sachets– We dried rose petals with our dehydrator. Later we made sachets. Mini cherry pies, boiled peanuts, sandwiches cut into shapes, and little cakes! Nana was a proper host! The boys and I had a photo shoot. I had fun playing Anne. Leeland as Gilbert, ha! Whoever he was…he was plum cute! The USA- We did a quick study of the United States and then did more that Summer. We began with making a project board with all the capitols and info on the United States Flag and pledge. We pulled out our big USA puzzle. Michael read several books on the history of each state and what they are famous for. I really like Carol Crane’s State Alphabet books. and enjoying cookies with a friend.